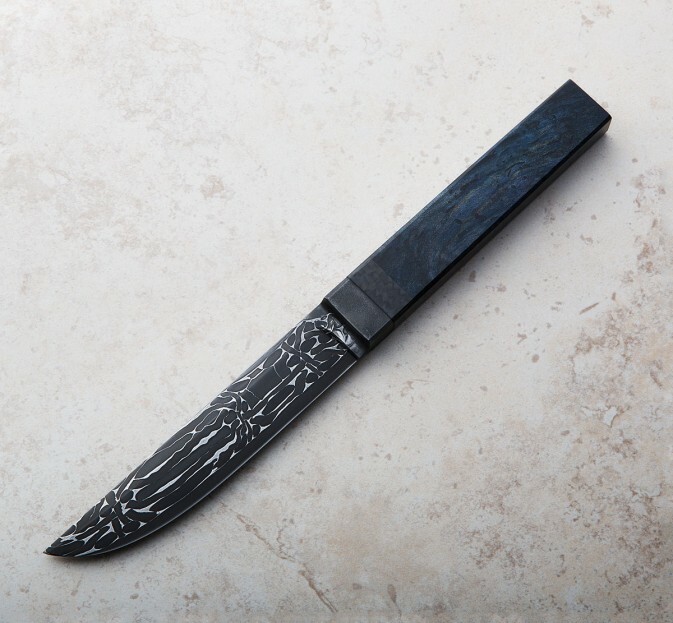 Forged from damascus made of 4800kc, 1095 and W1 carbon steels, the 140mm / 5.5" blade of this stiff, integral boning knife by Nick Anger displays a beautiful pattern and high contrast for a unique and captivating look. 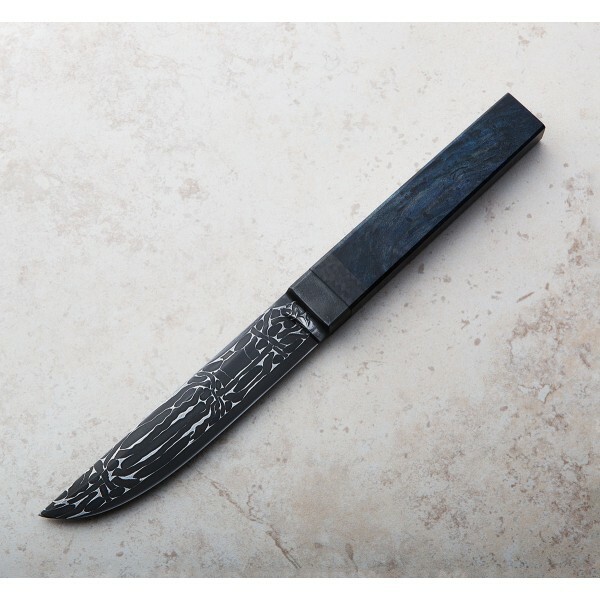 The wide, rectangular handle in stabilized, dyed blue maple burl with carbon fiber spacer is comfortable and fills the hand, making tough boning tasks a breeze. Another stunning one-of-a-kind specialty chef knife made for daily use in breaking down proteins by the master of integral damascus blade, built by hand in northern Vermont. 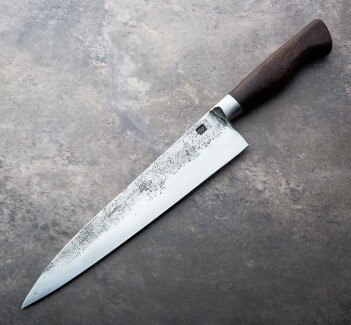 Nick Anger builds hard use, one-of-a-kind world class chef knives at his one-man shop in Northern Vermont. 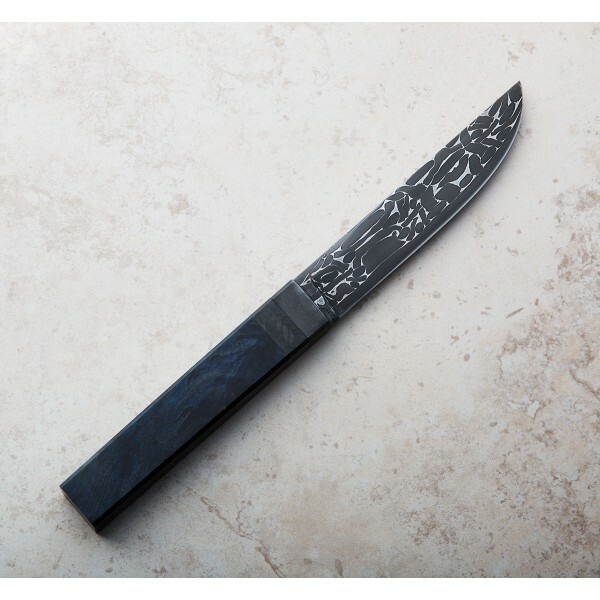 Creating small batches of damascus, Nick focuses on integral bolster construction and simple, classic and comfortable handle designs that result in stunning knives built for daily use. A student of metallurgy and the nuances of hand-forging for superior culinary blades, Nick makes some of the most sough-after knives in the business and we are proud to work with him here at Eatingtools. Blade length: 140mm / 5.5". Overall length: 280mm / 11". Blade spine width at heel: 3.3mm. Blade spine width 1" from tip: 1.3mm. Blade height at heel: 27mm. Weight: 6.0oz / 170g. 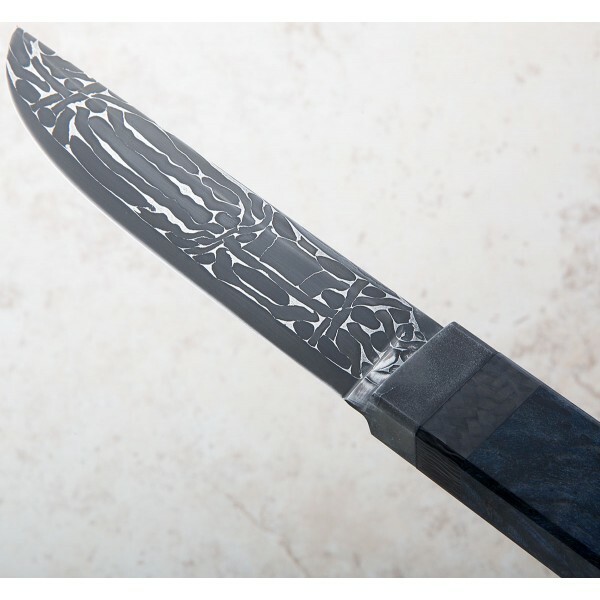 Blade: 4800kc / 1095 / W1 housemade damascus steel. Handle: Stabilized, dyed blue maple burl with carbon fiber spacer.